What is Air-Fuel Ratio and why is it important in Petrol Engines? The carburetor is a hydro-mechanical device which works on the principle of ‘Carburetion’. The term ‘Carburetion’ means breaking of gasoline fuel into smaller particles. This enables them to mix with air in order to burn in the combustion process. The carburetor helps in atomizing and vaporizing the fuel and mixes it with the air in varying proportions. This provides an ideal air-fuel ratio to suit the changing needs of the automotive engine. Vaporization occurs when the fuel changes its state from liquid to vapor (by heat). However, atomization occurs when the mechanical break-up of fuel takes place. This is where the role of the carburetor comes into play. Ideally, a carburetor should pass the mixture of completely vaporized fuel and air in proper proportion to engine’s intake manifold. To achieve a high degree of vaporization, manufacturers use heated intake manifolds and/or hot-spots in their systems. Also, the compression stroke creates high temperature & pressure. Thus, it provides the additional heat to achieve complete vaporization of the fuel. What is Air-Fuel Ratio in a Carburettor? The carburetor’s main function is to mix the fuel with air in a perfect ratio. It does so according to the engine’s speed and load conditions. Theoretically, the ideal mixture contains 15 parts of air and 1 part of gasoline fuel. Thus, it provides the air-fuel ratio of 15:1. However, the carburetor cannot always provide the ideal air-fuel ratio consistently. This results in an excess quantity of fuel in relation to air. Hence, engineers later designed Fuel-Injection systems to achieve better efficiency from Petrol Engines. It is necessary to get this perfect air-fuel ratio of 15:1 all the time. This is because the air in the mixture provides the oxygen needed to burn the fuel completely. If the air is too little, then it provides inadequate oxygen for combustion. This results in unburnt fuel emitting the tail-pipe and going waste. If there is an excess of air, then it provides more oxygen. This results in slow & erratic burning which results in loss of power. The air & fuel get mixed in varying proportions within which the combustion takes place. The engine operating conditions demand varying range of the air-fuel ratio/mixture. The boundaries of this range are known as the upper and lower limits of combustion. The lower limit is between 7-10 parts of air by weight to 1 part of fuel (7:1 – 10:1 – rich mixture) which is barely enough for the engine to idle. The upper limit consists of around 19-20 parts of air by weight to 1 part of fuel (20:1 - lean mixture). An average ‘cruising’ operation needs an ideal air fuel ratio of 15:1 to 17:1. To achieve maximum power and quick speeding/overtaking, the engine needs ‘rich’ mixture. It is about 12-13 parts air by weight to 1 part of fuel (12-13:1 air fuel ratio). Also, when starting a cold engine, it needs the rich mixture which the ‘choke’ provides. However, to achieve maximum fuel economy the engine needs a leaner air-fuel ratio of 16:1 to 17: 1. The air fuel ratio of 19-20:1 is known as the 'Ultra-Lean Mixture' that some carburetors provide. However, this mixture burns slowly and irregularly. Thus, it results in power loss. Hence, a modern-day carburetor must provide proper proportions of air-fuel mixture automatically to meet engine’s varying operating demands. 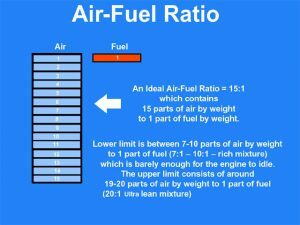 Home » Technical Anatomy » What Is Air-Fuel Ratio & It’s Importance in the Engine?